While climbing is, first and foremost, a mental and technical skill sport, long-term improvement—and pursuing your genetic potential—demands getting stronger in a number of climbing specific ways. Numerous research studies have confirmed that elite climbers, compared with non-elites, have higher grip-strength-to-mass ratio, greater forearm endurance, and a higher rate of force development in the finger flexors. Therefore, assuming that you have solid technical and mental skills, training for stronger fingers is paramount to taking your climbing to the next level. Knowing now that research has confirmed that strong fingers matter, let me detail five reasons why increasing your absolute finger strength will improve your climbing performance. 1. Stronger fingers can grip smaller holds. Duh! Seriously, though, long-term improvement at gripping smaller and smaller holds—essential for climbing harder—depends on building a higher level of absolute (limit) grip strength. Fingerboard training (with the right training protocol) is unquestionably the best method of training maximum grip strength, whereas the campus board rules for training “contact strength (i.e higher rate of force development in the finger flexors). 2. Stronger fingers can endure longer when climbing on submaximal holds. Explaining why requires a bit of exercise physiology, so bear with me for a moment. When your fingers are gripping at just 20% of maximum voluntary contraction (MVC) blood flow through your forearm flexor muscles begins to slow….and at a contractile force of about 50% of MVC (and above) the blood flow occludes completely. When blood flow slows—or stops—power output declines precipitously after about 10 seconds and, depending on the relative difficulty of the sustained grip (% MVC), failure will follow in a matter of seconds to, at best, a minute or two if the finger flexors are contracting at a force far less than 50% MVC. Anyway, lack of blood flow and oxygen supply is the crux of the matter, since oxygen is required for creatine phosphate resynthesis (CP is a vital intracellular energy source) and blood flow is needed to remove metabolic byproducts of anaerobic lactic energy production (more on this in future articles on Power/Strength Endurance training). Thus, when resistance climbing through a long-sequence of relatively difficult, yet submaximal holds, the greater the perfusion (delivery of blood to the capillary bed) the longer you will endure. Given the above understanding of blood flow occlusion as a function of percentage of maximum voluntary contraction (MVC), it’s now easy to understand that in gaining a higher level of maximum grip strength (a greater MVC) you will be able to support your body weight (or whatever part your feet aren’t supporting) with a smaller percentage of MVC. This is a powerful concept and a critical guiding principle for effective training! Summarizing: Increasing the MVC of the finger flexor muscles enables contraction at a lower percentage of maximum (compared with the weaker fingers of the “old you”) when climbing on similar submaximal terrain, thus allowing for increased blood flow (and greater use of the aerobic energy system) and improved forearm endurance. 3. Stronger fingers can rest and recover on smaller holds. I’m sure you’ve seen videos of rock stars, such as Chris Sharma and Adam Ondra, pausing in the middle of some long, steep, and ridiculously hard climb to shake out and somehow rest on a small “finger bucket” that would in no way be a rest hold for the mass of climbers. Yet somehow these guys can stop and catch their breath and recover enough power reserve to push on and finish the climb. 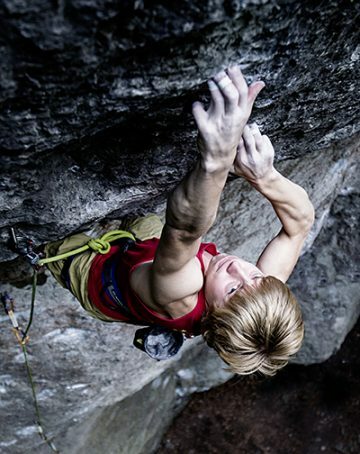 What is their secret to resting on small holds—let’s call it a “micro rest”—that would pump out the average climber? Strong fingers, of course! As explained in #2, blood flow is the key to resynthesizing CP (essential for brief, high power movements) and removing fatiguing metabolic byproducts of the anaerobic lactic energy system (the predominant energy system when climbing hard, sustained sequences lasting between twelve seconds and a minute or two). For a rest hold to be good enough to hang onto for a meaningful rest (say, fifteen to thirty seconds or more), you must be able to grip the hold using less than 50 percent of your MVC—only this way will there be enough rejuvenating blood flow into both the shaking and gripping arms. 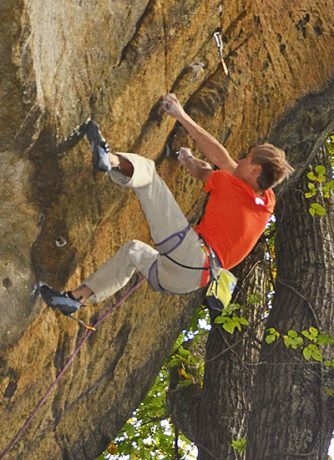 Therefore, a climber with “average” grip strength may require a 4-inch (10cm) deep hold to recover (the smallest hold he can grip for an extended time at <50%MVC on, say, an overhanging route with marginal footholds) whereas the 5.15 climber can likely shake out on a one-inch-deep hold (2.5cm) thanks to a very high relative grip strength that allows him to grip with less than 50% of MVC (with the aid of proper foot and center-of mass positioning, of course). 4. 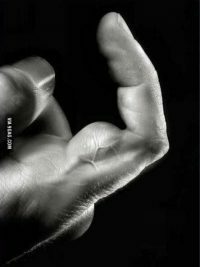 Stronger fingers have more stamina. Occasionally you hear a mind-boggling media report of some pro climber on-sighting or redpointing multiple 5.14 routes in a day and then doing it again the next day . . . and maybe even the next! How is this even possible? Let me tell you a story about a climber named Alex who does this with regularity. I’ve climbed with Alex a few times in recent years, and last October I was with him at the New River Gorge when, in the matter of a few hours, he warmed up on a couple 5.13+ routes and then proceeded to do a first ascent of a 5.14b and a second-go second ascent of another 5.14b. Sounds like a fatiguing day of climbing, right? Not for Alex. In fact, he climbed other routes at the 5.14 grade both the day before and the day after! How is this possible? Before I embellish further on the importance of getting stronger, I must point out that Alex possesses world-class technique and a very strong mind. That said, the master key is that Alex is really strong! We have yet to see what Alex’s true climbing limit is (but it will be fun to watch in the coming years), but I can tell you that climbing 5.14b routes is nowhere near his limit. So for Alex to climb at this level on successive days is similar to 5.12 climber doing 5.11 routes on successive days or a 5.14 climber sending multiple 5.13a routes. The bottom line: By increasing your limit strength and advancing your high-end climbing ability, the submaximal level at which you can climb with relative ease and aplomb—and in high volume—is elevated. Therefore, by making a long-term training commitment to getting stronger (and improving your mental and technical game), you may someday find your current maximum climbing level to be relatively “moderate” and achievable in volume! 5. Strong finger make climbing more fun. Pulling on smaller holds and gliding more easily over difficult terrain brings joy to the heart. And, of course, breaking into the next grade and sending a hardest-ever route is a rare, transcending experience that can make your season and, in fact, make a great memory for life! In closing, the quest for stronger fingers must be viewed as a gradual, long-term endeavor at which you can improve year-over-year for a decade or more, given a properly nuanced training program. A haphazard, shotgun approach to finger training (i.e. doing lots of everything) will be, at best, marginally effective…and might even get you injured. Steady, long-term gains in grip strength come from execution of an smartly designed, appropriate program (for your ability and climbing experience) that dovetails just the right training stimulus with adequate rest (both between exercises and workouts). I’ll present these important details in upcoming articles, or you can fully immerse yourself in the science of climbing harder by reading the latest edition of Training for Climbing (see below).